Last week was a crazy busy week. On Wednesday we eloped up to Tahoe and got married! Now I'm proud to be Mrs. Martin. As one of my friends said "I bet this wasn't in your meal plan!!" If fact, none of the meal plan last week was accomplished - but we sure had a good time celebrating... and we'll be planning an official celebratory party this summer too. And while getting married wasn't officially on my 30 before 30 list - maybe I can substitute if for something else. I did accomplish one more item on my list though. 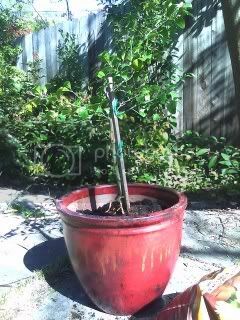 I planted my Rangpur lime tree! I can't believe it took me so long. I bought the tree 2 years ago and now its finally planted in a pot. So #26 is off my list! I even took a photo to prove it. That means I have finished 6 items (#5, #6, #16, #19, #26, #30) and I have a looong way to go by June. I better get busy. Or expand my deadline to include my 30th year. Is that cheating? No meal plan this week. Its another busy one. Hope everyone has a good one! Thanks again Trinity to you and your beautiful family for the sweet card and the help with my 30before30 list. I'm excited for my helicopter ride! !